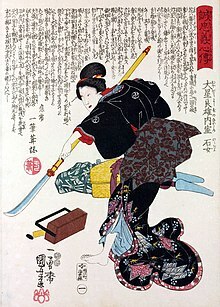 In later Japanese history, the naginata was associated with female samurai. Naginatajutsu (長刀術 or 薙刀術) is the Japanese martial art of wielding the naginata (長刀). This is a weapon resembling the medieval European glaive. Most naginatajutsu practiced today is in a modernized form, a gendai budō, in which competitions also are held. Multiple theories concerning the weapon's exact origins are in debate. It has been suggested that it developed along the same lines as Okinawan kobudō weapons as a modified farming tool. Another theory states that it is the result of the Japanese modifying a Chinese Guan Dao that bears a similar appearance. Others say that a creative samurai in need of a longer weapon attached a sword to a pole. Perhaps the simplest explanation is the natural development of polearms. Polearms are intended as mass weapons, to be used not just by individual warriors, but by formations of soldiers together on field battles and not for dueling. When fighting in close order, two-handed cut-and-thrust weapons, such as halberds and glaives, are much more efficient than mere spears or swords because of their versatility compared to spears and longer reach compared to swords. Fighting in massed formation does not require similar individual weapon-handling skills as required by a skilled swordsman. Naginata are almost identical in appearance to both the glaive and the guan dao, and it is most likely result of parallel evolution. In the early history of its use, the naginata was primarily used against cavalry, as its length kept the wielder a safe distance from horses and their riders. During the Tokugawa period (1603–1868), the naginata was transformed into a symbol of status for female samurai, as well as being the primary means for a woman to defend her home while her husband was away at war. This period also saw the propagation of the naginata as a feminine art and the weapon serving as more of a symbol of devotion to a woman's family. Many koryū ryūha, such as the Tenshin Shoden Katori Shinto-ryu, Jikishin-Kage-ryu, Tendō-ryū and Hokushin Ittō-ryū include naginatajutsu in their curriculum, as do arts such as Shidare Yanagi-ryū and budo organizations such as the Bujinkan. 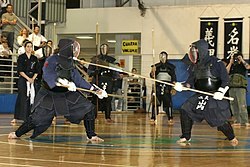 Modern competition with bamboo naginata. Today, the naginata is most often used in the form of a sport called "new Naginata" (新しいなぎなた, atarashii naginata), or simply "Naginata," which uses kendo-style protective equipment and wood or bamboo weapons. In Japanese, Naginata, the sport, is distinguished from the naginata, the weapon, by being rendered in hiragana (なぎなた) rather than in kanji (長刀). In other languages, the name "Naginata" is usually capitalized to make the same distinction. It is most common in Japan for Naginata to be practiced by women; in other countries, the gender balance is more even. Outside Japan, Naginata is practiced in Europe, Australia, North and South America. Naginata is governed in Japan by the All Japan Naginata Federation (AJNF), and outside Japan by the International Naginata Federation (INF).